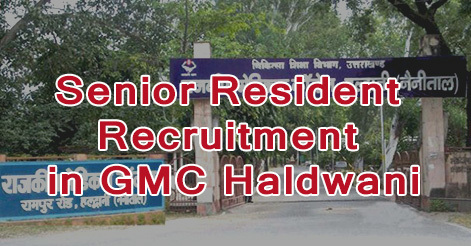 Government Medical College, Haldwani has released advertisement for the recruitment of Senior Residents in various departments. Walk-in-Interview for 31 posts of Senior Resident will start from 25 July 2018 to till filling up the post. Interested and qualified candidates can participate in the Walk-in-Interview to be held in Government Medical College, Haldwani. Max. 40 years (as per MCI norms); Reservation as per Uttarakhand State Government Rules. Senior Resident: On Contract basis appointment shall be initially for one year contract, which may be extended up to a maximum period of three years. Interested candidates can attend the walk-in interview. Walk-in-Interview will be held every working day starting from 25th July 2018 to till filling of the post(s) during 11:00 am to 02:00 pm at “Office of the Principal, Government Medical College, Haldwani (Nainital) Uttarakhand”. Help us to improve this article/job posting "Senior Resident Recruitment in Government Medical College Haldwani". We would be glad if you can comment below and provide your valuable suggestions and feedback. If this page have any wrong information/list or out of context content, then you can report us as well. I am army ex-serviceman (honorary captain) I am interested uttrakhand govt job. I am 47 year old .I have 28 year experience in army verius field.